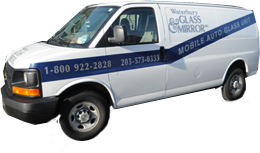 Waterbury Auto Glass warrants their installation of new automotive glass to be free from defects in materials and workmanship upon delivery, and is subject to a Limited Warranty for as long as you own the vehicle against leaks or molding issues. THIS LIMITED WARRANTY DOES NOT COVER leakage or stress cracks caused by pre-existing rust, structural damage, or other un-repairable damage caused by vandalism or impact with foreign objects or aftermarket parts. Rust inhibits the adhesion of the glass to the body of the vehicle the presence of rust may lead to problems with water, air leaks, and stress cracks. If rust is present, we cannot warrant the installation. Please note that any work, improvement, alteration done by anyone other than a qualified Waterbury Auto Glass, LLC technician will automatically void the Waterbury Auto Glass, LLC Limited Warranty. will come to your home or office. All types of auto glass serviced.